A Stunning Halo Diamond Ring For An Anniversary Gift! What if you woke up to this stunning halo diamond ring every morning? That would definitely be a ray of sunshine! This beauty is about to leave Malka Diamonds & Jewelry's downtown Portland shop. There are now two of these stunning rings floating around on Portland's fingers. Both rings were purchased for 10 year anniversary gifts. Both customers were hunting for a ring they could re-mount their diamond in. They were searching for a ring that was set low and had the wow factor. This piece definitely does. The ring shown houses a 2.02-carat diamond. The center stone is surrounded by 1-carat total weight of diamonds - 200 (1mm) stones! It's basically the halo split-shank diamond engagement ring on steroids. We are gitty about it and can't wait to see our customer's face when she places this beauty on her finger. Here is to a sparkly Wednesday. Malka Diamonds Hires An Additional Jeweler! Malka Diamonds of downtown Portland, Oregon is staying very busy. So busy that we decided it was time to add another jeweler to the our full-service shop. We are pleased to introduce Tessa! We first met Tessa at the GIA's (Gemological Institute of America) job fair. She came highly recommended by her professors, recruiters as well as several of her fellow classmates. We met many students that day but Tessa stood out. Her education background is quiet robust. She not only comes with a Bachelor of Arts in Sociology, Criminology and Spanish but she has a strong education in the metal arts as well. She first studied metalsmith at the Denver College of Metal & Arts. She then made her way south to GIA Carlsbad, San Diego campus. For the last two years, Tessa has been submersed in the world of jewelry. Her certifications include Graduate Gemologist, Graduate Jeweler, Accredited Proficient Jewelry & Certified CAD (computer aided design)/CAM (computer aided manufacturer). It's clear that with the above education, Tessa is bringing a lot to the plate at Malka Diamonds. We look forward to her working with David and I in the store as well as spending time on the jewelers bench with David Stanwood, our craftsman jeweler. In addition, we are eager to take her knowledge on the CAD matrix program and implement it into our custom process. Stay tuned for a future purchase of a 3D printer. A CAD printer will use the computer program that Tessa has become familiar with and print out a wax form. Needless to say, Malka Diamonds is going stong and we are pleased and honor to have our Tessa on our team! Come by and meet her soon. A Stranger Catches This Breathtaking Utah Engagement! We, at Malka Diamonds, are pleased to announce that the Zeghani bridal collection by Simon G has arrived! Zeghani is a sought-after bridal line which features exceptionally crafted fine jewelry. Simon G is a household name that continues to be a leading bridal line since they launched their first line. Zeghani is one of the collections that is housed at Simon G and is made to reach all budgets. The highly coveted company chose Malka Diamonds as one of the few jewelry stores in the Northwest to house their stunning and classic bridal line. We are honored and could not be happier. Check out some of the beautiful engagement rings that are settling into our Malka Diamond & Jewelry cases by clicking the link ( latest collection page ) or heading to malkadiamonds.com. A Touching Proposal With A Custom Three-Stone Diamond Engagement Ring! "We began our relationship together on January 11th 2013. After this past Christmas break, we were planning on having a special date to recognize being together for one year. I made arrangements to have dinner at our friends' house where we actually had our first date almost a year ago. I did not initially tell her the details of what we would be doing but everyday I gave her a clue concerning where we would be going, with whom we would be, and what we would be doing. As soon as Emily returned, it was clear that she knew what was about to happen. I briefly recounted the changes in our relationship as I placed the ring I had custom-created at Malka Diamonds on her finger. I got down on one knee and said, "Emily, will you marry me?" and she said, "Yes!" and quietly exclaimed. "We're going to get married!" Thank you John for sharing your story and photos with Malka Diamonds & Jewelry. We are honored to be part of this amazing time in your lives. We are looking forward to meeting Emily soon. 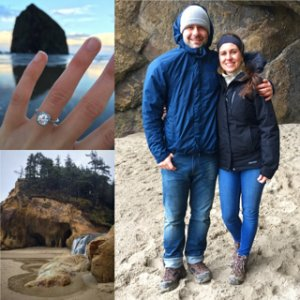 Emily & Caleb found us on yelp when they were looking for an independent jewelry store in Portland Oregon. The two were in search for a shop that could restore a family heirloom. When Emily & Caleb came in to Malka Diamonds it was clear that they were very excited about their recent engagement. Caleb told us how he proposed. He mentioned that he asked Emily on a hike one gorgeous sunny Oregon day and Emily, of course, said yes. Caleb proposed with his grandmother's diamond engagement ring. The piece was in need of some restoration and sizing. We started to work on it quickly so that the two could show it to family on their upcoming trip. Caleb mentioned to his mom that he had found a jeweler in Portland that was taking care of the ring. While we were working on the ring we received the below note about the ring. We always love to hear the history of heirlooms. When they came in to pick it up, they were blown away. Congratulations Caleb & Emily! We are so thrilled for you both and thank you for allowing Malka Diamonds to work on your family ring. "I want to thank you for taking care of Caleb and Emily and my mother's diamond engagement ring. I just spoke to Caleb and he described the work you will do to transform the ring into exactly what they want it to be. It is a very exciting time and a very meaningful experience for all of us. My parents were engaged and married in Attleboro, Massachusetts and my father was in the jewelry manufacturing business. I wish I had a bit more history on the diamond but I think my grandfather got it from a jeweler friend. I had it informally appraised in Greenfield MA a few years ago. I know it is not a "big" diamond, but I think it is a very nice one. The setting it is in is not the original. My sister and my parents went mining in Montana around 1975 and my sister found a sapphire and my mother gave her the original setting for the stone she found. The current setting for the diamond is very 1970s in style wouldn't you say? My parents were married in 1944. I can't wait to see Emily's engagement ring and thank you again for taking it on. Sincerely, Betsy Antaya, Caleb's mom"
This adorable couple came down to Malka Diamonds & Jewelry in Portland, Oregon last April to meet with David and I. They received a crash course on diamonds from David Malka owner of Malka Diamonds and a resident graduate gemologists from GIA. They returned this past Saturday and choose an amazing and incredible rare diamond. Majority of diamonds have what you might call "birthmarks". The marks are natural inclusions found in the stones. The clarity of the diamond is determined on how difficult it is to see the stone's flaws. However, in nature there are only .0009 percent of diamonds that are internally flawless. We have a couple of these in our downtown Portland diamond district shop. This adorable couple looked through some amazing stones and found a 1.33 carat G color Internally Flawless diamond that they fell in love with. They were both gitty when we were able to set and size the gorgeous ring on the spot. Thank you for making the trip from Vancouver B.C. and Congratulations you two!